PASADENA, Calif. — A NASA spacecraft is providing new evidence of a wet underground environment on Mars that adds to an increasingly complex picture of the Red Planet’s early evolution. Together, these new observations suggest the formation of the carbonates and clay in a groundwater-fed lake within the closed basin of the crater. Some researchers propose the crater interior catching the water and the underground zone contributing the water could have been wet environments and potential habitats. The findings are published in Sunday’s online edition of Nature Geoscience. 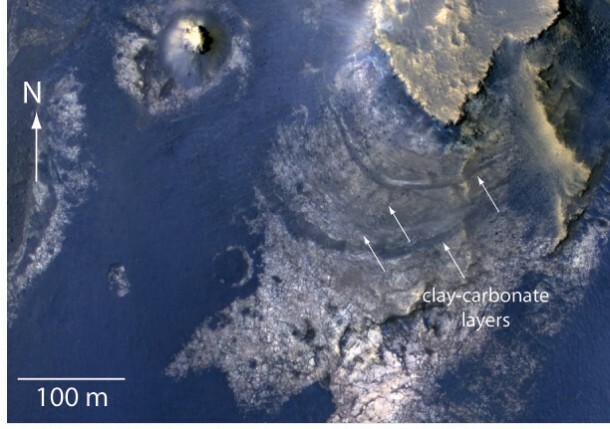 “Taken together, the observations in McLaughlin Crater provide the best evidence for carbonate forming within a lake environment instead of being washed into a crater from outside,” said Joseph Michalski, lead author of the paper, which has five co-authors. Michalski also is affiliated with the Planetary Science Institute in Tucson, Ariz., and London’s Natural History Museum. “This new report and others are continuing to reveal a more complex Mars than previously appreciated, with at least some areas more likely to reveal signs of ancient life than others,” said Mars Reconnaissance Orbiter Project Scientist Rich Zurek of NASA’s Jet Propulsion Laboratory, Pasadena, Calif. The Johns Hopkins University Applied Physics Laboratory in Laurel, Md., provided and operates CRISM. JPL, a division of the California Institute of Technology in Pasadena, manages the Mars Reconnaissance Orbiter for NASA’s Science Mission Directorate in Washington. Lockheed Martin Space Systems in Denver built the orbiter.